Northern (Rana [Lithobates] pipiens) and southern (Rana [Lithobates] sphenocephala) leopard frogs face a number of threats to their survival: they must capture enough food to live, find suitable habitat, avoid natural predators and avoid ending up on a human’s dinner plate -- leopard frogs are commonly consumed in the southeastern United States. To keep themselves safe, leopard frogs have evolved a number of adaptations and defensive behaviors. Leopard frogs are native to the eastern United States, though they have been introduced outside of their natural range due to commercial breeding operations and the pet trade. They are medium-sized, semi-aquatic frogs that sometimes reach 4 inches in body length. Leopard frogs have a green to brown base color with various dark colored spots, bands and lines on the dorsal surfaces; the ventral surface is light green to off-white. Leopard frogs eat insects and small vertebrates. Their primary predators are snakes, fish, foxes, raccoons and birds. The leopard frog’s first line of defense is to remain camouflaged with its surroundings and avoid detection entirely. Leopard frogs often lurk in vegetated patches of shoreline where their dots, bands and color variety help them to blend in. As snakes and mammals primarily hunt by scent, leopard frog crypsis has likely evolved as a defense against birds. 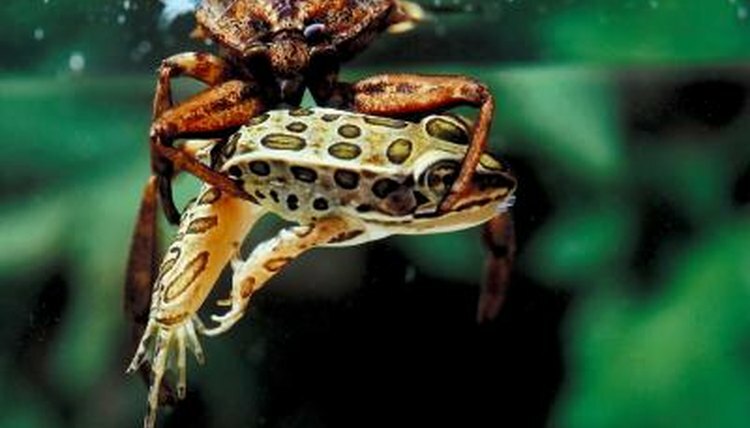 Leopard frogs spend long periods of time being still, trying to ambush prey, which furthers their attempts at crypsis. Leopard frogs will often remain motionless when they notice a predator, but if the predator gets too close, they will quickly jump into the water. The explosive jumping ability of the frogs allows them to rapidly increase the distance between themselves and the predator. Often, the frogs make a 90 degree turn after hitting the water and then find a place to hide -- fooling the predator who searches in the frog’s initial direction of escape. Frogs caught far from the water will engage in a series of erratic jumps until they find a hiding spot -- or get caught by the predator. Frogs are vocal creatures, and sometimes these vocalizations are used defensively. When a frog leaps to the water from his terrestrial hiding place, he will often emit a loud squeak, which warns the other frogs in the area that a predator is afoot. Often, several other frogs will then dive into the water. Additionally, some frogs will emit loud screams when grasped by a predator that may serve to startle the predator or even attract secondary predators. In some areas, leopard frogs are sympatric with pickerel frogs (Rana [Lithobates] palustris). In a phenomenon termed Batesian mimicry, the leopard frogs begin looking like the pickerel frogs. The normally round spots of the leopard frog become square like those of the distasteful and similar-looking pickerel frog, which presumably deters predators. What Kind of Frog Uses Camouflage? How Does Camouflage Protect a Frog? Do Frogs Estivate in Mud?